Today the Peckham Society hosted the unveiling of an English Heritage Blue Plaque on the site of the house at 142 Queen’s Road Peckham in which Drs Innes Pearse and George Scott Williamson set up the first phase of the ‘Peckham Experiment’ – the Pioneer Health Centre. This was an initiative aimed at uncovering the conditions that would promote health, rather than simply prevent or cure disease, and involved a social club for members as well as regular medical check-ups. A purpose-built centre, designed by the modernist architect Sir Owen Williamson, was subsequently constructed and opened in 1935. 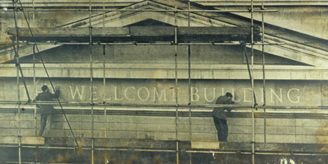 However, although the Centre, which had had to close down for the duration of the Second World War, re-opened in 1946, it could not readily be integrated into the the post-war Welfare State and National Health Service, and closed in 1950. The building has since undergone several changes of use and is now converted into flats. The event was attended by members of the Peckham Society and officials and board members from English Heritage, as well as members of the Pioneer Health Foundation which preserves and promotes the heritage of the Centre. Pam Elven, a Centre subscriber when it was still in action, was in attendance. 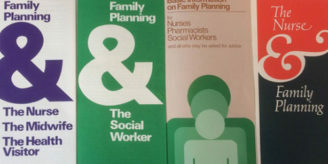 The surviving archives of the Pioneer Health Centre are now held in the Wellcome Library – the catalogue is available via the Archives and Manuscripts online database by putting SA/PHC into the reference field of the search interface. The Library also holds many of the publications produced by the Centre staff during its lifetime and following its closure.